A lantren made frae a pumpkin. Hallae E'en (or Hallae'en) is the nicht afore Aw Saunts Day, that is: atween the 31st o October an the 1st o November. Weans gets buskit in sicna a wey tae mak ye feart... makkin on tae be a carline, or the Deil. Thare are mony tradeetions adae wi Hallae E'en sic as guisin, doukin for aiples an cairvin lantrens frae neeps or pumpkins an aw. The Celtic Neopagans consider the season a haly time o year. Som o thaim mak offerins tae the "guid gods" o the Celtic cultur an meethologie. The Celtic equivalent tae Hallae'n is Samhain, bein the verra same day an merks the end o the Hairst in the ferms. In Tam Lin, stropha 22: "The nicht it is auld Hallow E'en/When elfin fowk do ride,/An thaim that woud their true-loves win/At Miles Cross they maun bide." The tale taks maistly place in the Hallae'en nicht. 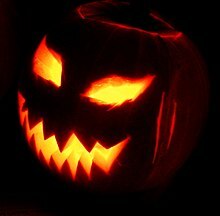 Wikimedia Commons haes media relatit tae Halloween. This page wis last eeditit on 14 Juin 2017, at 00:38.